One year after a devastating series of wildfires ripped through Northern California wine country, destroying thousands of homes, the U.S. Army Corps of Engineers' first experience cleaning up after a wildfire has turned into an expensive bureaucratic mess and California's top emergency official suspects fraud played a role. In October 2017, state and local officials lacked the resources to quickly clear still-smoldering and toxic debris from 4,500 homes destroyed by a wildfire in and near Santa Rosa. So the Army was called in. The first complaints started almost as soon as the first dump truck was loaded in November. Homeowners said workers were digging too deep and taking too much dirt from their lots. They also said perfectly fine driveways, retaining walls, sidewalks and the like were damaged or removed. By the summer, nearly 1,000 homeowners had flooded the Army, state and local officials with complaints. 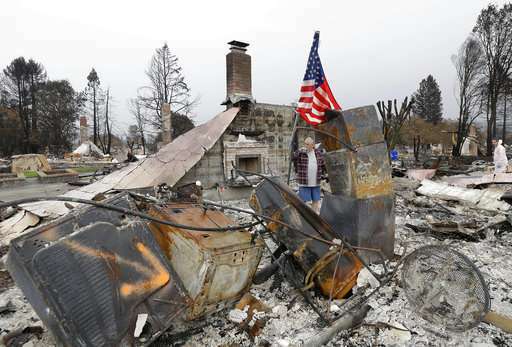 After its contractors hauled away 2 million tons (1.8 million metric tons) of debris, the U.S. Army Corps declared mission accomplished and left without responding to homeowners' complaints, Sonoma County Supervisor Shirlee Zane said. 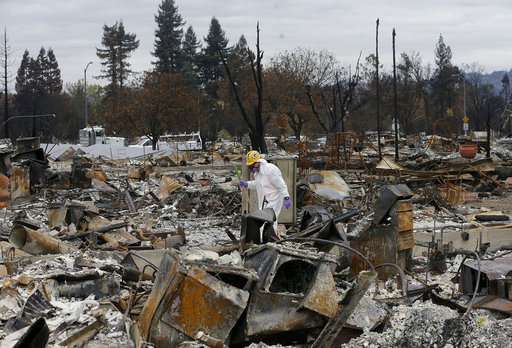 "These folks were traumatized by the fire and then traumatized again by the cleanup," said Zane, who represents Santa Rosa's hardest-hit neighborhoods. "Someone needed to help us." In August, Zane and a contingent of Sonoma County officials trekked to the state capital in Sacramento and persuaded the California Office of Emergency Services to fix what the Army wouldn't. Director Mark Ghilarducci said the Office of Emergency Services has spent millions repairing the damage, and more work remains. In a letter sent last month, Ghilarducci demanded that the Army reimburse the state and return to California to fix the lots still in need of repair. Ghilarducci said it's "probable" that unscrupulous contractors committed fraud, citing "egregious oversight" by federal officials. "Given these subcontractors were paid per ton of soil removed, it is probable this over-excavation was an intentional effort to capitalize on this tragedy by defrauding the government," Ghilarducci wrote to the U.S. Army Corps last month. Corps spokesman Mike Petersen said no evidence of fraud has been reported. He said the Federal Emergency Management Agency was preparing a response to Ghilarducci's letter. Ghilarducci also argued the U.S. Army Corps failed to properly monitor the cleanup and its subcontractors' performance. 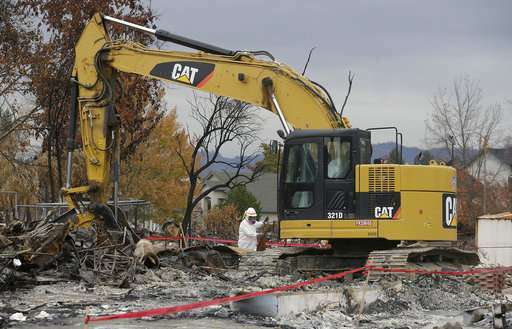 "Due to this egregious oversight," Ghilarducci wrote, "contractors caused substantial damage to many survivors' properties resulting in revictimization of the affected wildfire survivors." In addition, the California Occupational Safety and Health Administration fined Chico-based Randy Hill Construction $11,700 after one of its workers was fatally struck by a truck while dumping debris. The agency found the truck's safety system was improperly disconnected and was the reason it accidentally started and ran over 60-year-old Ezekiel Sumner in December. Hill Construction did not return phone calls. He said the Corps was satisfied with the work of the three main contractors, and "the great majority of subcontractors on the program operated with high professional standards." The U.S. Army Corps of Engineers is a major Army command, composed of about 37,000 civilian and military personnel. "This caused issues in the debris removal process," the U.S. Government Accountability Office concluded in a report released last month. The GAO report made no recommendations but noted the cleanup effort was California's biggest since the 1906 San Francisco earthquake. 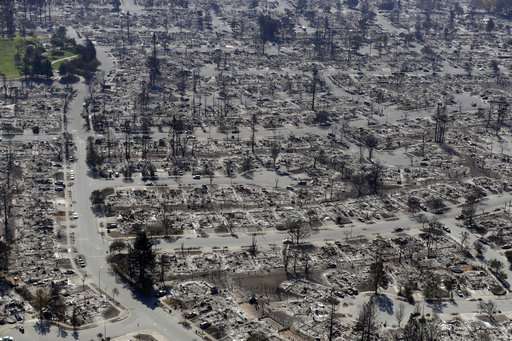 Most complaints about the cleanup come from Santa Rosa residents and other Sonoma County residents where the wildfire struck an urban center. But at least 100 homeowners in rural Mendocino County have lodge complaints of "over excavation." 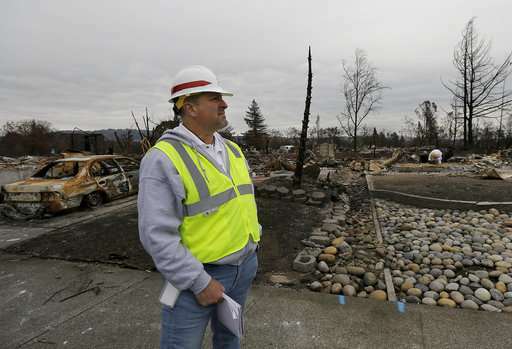 Karen Erickson said the U.S. contractors added at least $200,000 to the cost of rebuilding her destroyed Santa Rosa home. She said contractors needlessly removed an undamaged driveway and dug so deep on her lot that they damaged her water pipes. Because the contractors showed up after an insurance adjuster inspected her property, Erickson said the damage done to her property by the cleanup wasn't factored into her insurance reimbursement. "Paying those guys by the ton was stupid," she said. "Who wouldn't load their trucks with as much as they could?" Lots of opportunities for fraud. Lots of contractors flock to disaster areas. In the North Carolina area, contractors get contracts from FEMA for cleanup, but only pay their employees $12 / hour, and no other benefits.